The WASH e-paper is an online magazine published at regular intervals in German and English. Each edition takes a closer look at a current key issue in the water, sanitation and hygiene (WASH) sector and related areas. It also provides updates on forthcoming national and international events, current publications and projects, as well as news from the sector. The e-paper is published by the German Toilet Organization in collaboration with the German WASH Network and the Sustainable Sanitation Alliance (SuSanA). Humanitarians increasingly view market-based programming (MBP) and cash-transfer programming (CTP) as an effective response to address humanitarian needs of affected people. This is particularly reflected in the cash commitments made under the Grand Bargain of the World Humanitarian Summit. The humanitarian WASH sector is still in its early stages of integrating MBP/CTP as a standard practice. Issue No #7 in particular is a result of a thematic cooperation with the Oxfam Global Humanitarian Team and the Technical Working Group ‘Markets’ of the Global WASH Cluster (GWC). On the eve of the HABITAT-III Conference in Quito from October 17-20, 2016, the sixth issue of the WASH ePaper is devoted to the central topic of the conference, the “New Urban Agenda“. The current edition reflects the discussion and the strategic options in the WASH sector, addressing the New Urban Agenda’s blueprint for the management of urban water supply and sanitation. The content of this issue is mainly based on presentations from the Conference “Key Elements of a New Urban Agenda”, organised by BORDA in Bremen, Germany. The fifth issue of the WASH ePaper is devoted to the topic “WASH and Nutrition” and is a follow-up document to the Bonn WASH Nutrition Forum (the Forum), which took place in November 2015 in Bonn, Germany. Linking WASH and nutrition has globally gained momentum. Strong scientific evidence on the relationship of poor WASH conditions and nutritional implications have emerged over the past years. Numerous countries already acknowledge the importance of adequate WASH in their nutrition strategies and call for WASH interventions to be scaled up along with nutrition actions. Beyond that, the German WASH Network and a broad coalition of renowned partners campaign globally for better collaboration between WASH and nutrition actors. The current issue provides an overview of the current state of discussion and presents the results and recommendations from the Forum. This fourth issue of the WASH e-paper is devoted to sanitary facilities in refugee accommodation in Germany against the background of the current situation in Germany. It is in large part based on an internal guidance document from the German Federal Agency for Technical Relief (THW) drawn up in a close partnership between THW and the German Toilet Organization. 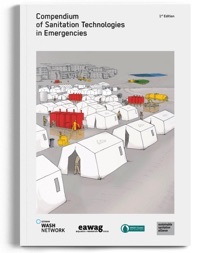 The aim of this issue is to provide guidance for everyone currently involved in WASH aspects of setting up, managing and/or maintaining refugee accommodation and to enable them adequately to address cultural specificities and requirements for toilet. The third issue of the WASH e-Paper is devoted to the issue of post-implementation monitoring (PIM) and ways of ensuring that the access to water supply and sanitation provided by WASH projects is guaranteed even after a project comes to an end. Comprehensive and robust monitoring of implemented WASH services– including, and especially, beyond the project term –is essential if WASH sytems are to be maintained, operated, repaired and, where appropriate, expanded in the long term. The approaches to post-project sustainability monitoring and safeguarding presented in this issue give an overview of the state of current international debate. In large part, they are based on an international PIM workshop organised by Welthungerhilfe and held in Addis Ababa in April 2015. This second issue of the WASH e-paper representsa snapshot of the current German WASH stakeholder landscape in the field of development cooperation and humanitarian aid. It also provides a comprehensive overview of Germany’s central public and civil society organisations, institutions and networks and the current focus of their work. The first issue examines the topic of WASH capacity development and provides a comprehensive overview of the latest basic and advanced training measures at both the national and international level. It also covers relevant WASH online platforms, blogs, newsletters, massive open online courses (MOOCs) and webinars.